My builder, Mark Bauer, and my three children thought it would be a great idea to have three Tri-5 convertibles, one of each year– I am sure my kids have ulterior motives! My wife (thankfully) has never complained about my classic car addiction. So I called Bob Dietzler to locate a 1956 convertible with a known history. He found me a one-family owned ’56 Bel Air convertible out of New Jersey. I was a little bit concerned about excessive rust, however he had good photos of the car prior to its marginal restoration. So the project began in November of 2011 and was completed in February of 2015. My only two requests to my builder were to use the original frame and to not cut up the body, otherwise I wanted him to think out of the box. He sure did! The build took over three years and virtually nothing was untouched. The objective was to build a classy but high-tech performance car. Many modifications were performed– some subtle, some not. The Chassis: The original chassis was used. The body mounts were shaved off and replaced with custom billet fabricated ones. To increase the rigidity of the original X-member, we added ¼-inch solid steel plating to the bottom of the frame, from the front to the rear suspension. Front and rear suspension components are from Heidts. Custom sway bar was built for the front. Custom aluminum fuel tank and trunk battery box was polished and installed. The Body: The body was left stock at my request. The firewall was removed and replaced with 1/8th-inch plate steel, fitted to the engine, and lowered to allow a stiffened assembly. This also gave access in the foot wells to place computers and electronics. The inner fenders were hand-formed and mounted to the firewall with billet fasteners. All the stainless was restored by Finishing Touch in Chicago, IL. The chrome work was done at various locations, including California, Arizona, and Minnesota. The Drivetrain: The drivetrain is an LS3 crate motor with a Vintage Air Front Runner drive system. Custom fabricated air cleaner system pulls fresh air from directly below the radiator. Custom built HPC coated headers are mated to a custom polished stainless exhaust with side ports. The electronically tuned Patriot mufflers are also polished stainless. The engine is mated to a 4L65E electronic automatic transmission with an electronic pushbutton shift. 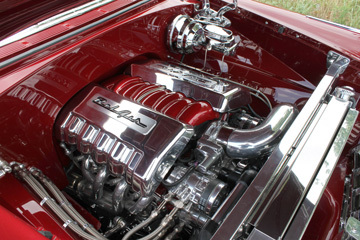 Engine covers are one-off custom billet. 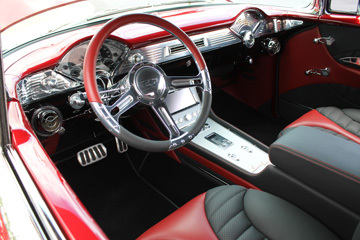 The Interior: The interior, designed and fabricated by Scott Downey of Downey Upholstery, utilizes three types of leather and chrome to bring out this unique design. The toe boards are removable since this car has two computers, seven electronic controllers and two fuse panels. There are three antennas for the radio and a back-up camera. The interior was also fitted with electric windows, vents, seats, tilt wheel, Dakota Digital Dash, Raingear wipers, and an electronic emergency brake. 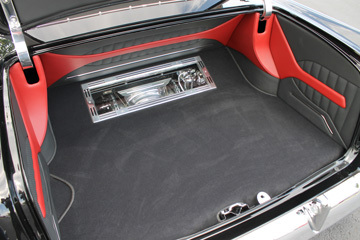 A billet and glass panel in the trunk allows one to view the rear end and facilitates in brake maintenance. 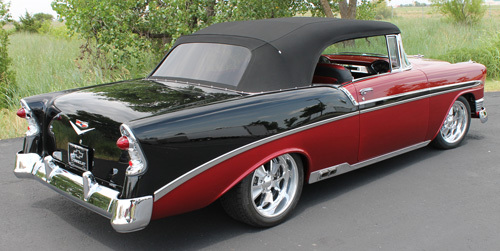 The convertible top was custom fit by Mark Limanen– yes Ed Limanen’s son for all you older classic car guys! Finally, the wheels were custom built by Budnik Wheels of California. After all this, I thought, what was next? Where should I debut this automobile? Then my builder Mark Bauer came up with the idea of entering this car into the 2015 Autorama Rod and Custom show in Detroit. What a great show for its first outing! We felt this build was unique enough to compete in this prestigious show. The car was viewed by thousands of people, including legendary builder Chip Foose. We qualified to compete for the Ridler Great 8, but were disappointed we didn’t make it. However, when we won first place for the Best Custom Rod out of the nearly 1000 automobiles, our disappointment quickly left us. What a nice accomplishment for this piece of rolling art! The hundreds of hours of thought, design and hand fabrication speak for themselves. Whenever you gaze at this car, you see another modification or custom billet part. I cannot thank nor list all those individuals who worked on this project. I can only tell them how grateful I am for their contributions. This is definitely my signature automobile. I want to help keep the Tri-5s alive, along with every other individual who relishes this classic era! 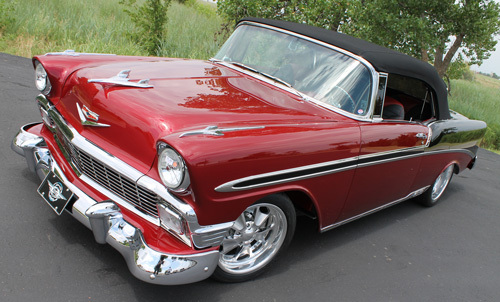 Editor’s note: John’s incredible ’56 scored 999 points at Chevy Classics 38th International Convention this past July.